Nainital is a beautiful and picturesque hill station which is known for its captivating landscape and tranquil surroundings. With a variety of attractions, the place opens arms to tourists from all across the globe. Nainital is a place which experiences a pleasant climate all around the year. So, it can be visited at any time of the year. This is an unbelievably exciting tour that takes you to two of the most amazing and offbeat tourist's destination of India. Blessed with plush natural beauty and ancient temples, Nainital is a popular hill station and is perfect holiday gateway for tourists in summers. The place is located in kumaon foothills in the holy state of Uttarakhand. It has got a scenic location, bounded by green hills with snowcapped mountains is a good choice if you want to enjoy the chill factor around Delhi. 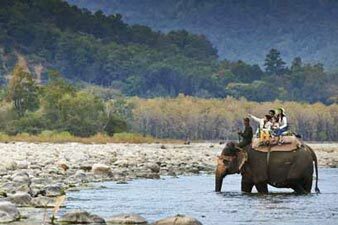 Corbett National Park situated in the Nainital district of Uttarakhand. The park has the glory of being India's oldest and most reputed national park. Corbett gave birth to first project tiger in India that was launched on April 01st, 1973. 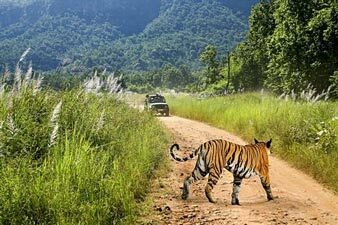 It is one of the few tiger reserve in India that allows overnight stay in the heart of the jungle. 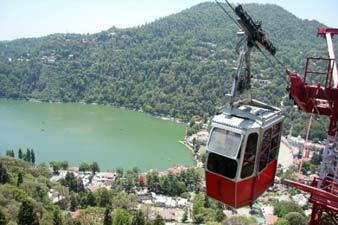 Nainital is not only the weekend holiday gateway but is also quite popular among newlywed couples. Upon arrival, check-in at the tourist class hotel and take rest for an hour. Soon after the lunch we will enjoy the sightseeing in districts of Lakes called Naini. You must get mesmerized with the panoramic beauty of soft white clouds, emerald jungles, rocky peak and green verdant valley. After you finish sightseeing come back to resort take rest and rejuvenate your mind and body in peace. Enjoy dinner and retire for the night. Nainital has a lot of deluxe and medium to budget accommodation options. Manu Maharani (Grassmere Estate), Chevron Fair Havens (Mallital), Naini Retreat (Ayarpatta Slopes), Grand Hotel (Nainital), Classic the Mall (Mall Road) and Krishna Hotel (The Mall) are the popular deluxe hotels of the city. Some of the medium to budget accommodation options include Maharaja Hotel (Upper Mall), Elphinstone Hotel (Mall Road), Alka - The Lake Side Hotel (The Mall Road), Pratap Regency Hotel (Nainital), KMVN Tourist Rest House Tallital (Tallital) and KMVN Tourist Rest House Mountview (Nainital) etc. The best time to visit Nainital is during the summer season. 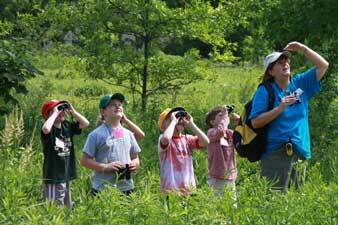 The hill station attracts a lot of visitors during the months between March and June. The temperature hovers between 14 ⁰C and 30 ⁰C. The ever-present cool breeze encourages you to relax in this paradisiacal place. The season is also perfect to go paddling on the various lakes in Nainital. A serene boat-ride in the evening, surrounded by bewitching views, is a favored activity of the visitors to Nainital. 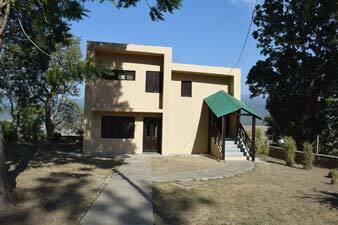 Arrive at Ramnagar and check in at resort which is pre booked for you. Take Welcome drink on arrivel, and then lunch. After lunch, take some rest and move to Dhangadi museum, Girija Devi Temple, Corbett Fall. In evening come back to your resort, enjoy bonfire with lite music in the winter. Have dinner on time and overnight in the wildlife resort. Early morning wake up call to get ready for Jeep Safari inside the Corbett national park with your expert guide. 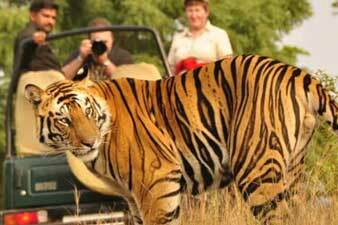 Get ready your camera to capture different activities of wildlife animals like Tiger, Elephant, black dear, leopard, wild cat etc. After the end of three hours jeep safari come back to resort. Take your breakfast. You may enjoy bath in swimming pool, soon after take your lunch on time. 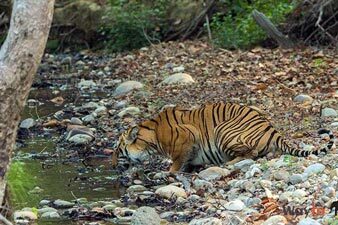 In the evening again be ready for supporting Tigers in different zone with your wildlife jeep safari. After that come back to your resort and take your dinner. Overnight stay at resort. Morning wakeup call & Jeep Safari at Dhikala, return back to forest lodge, breakfast & checkout. Return back to Dhangarhi gate. 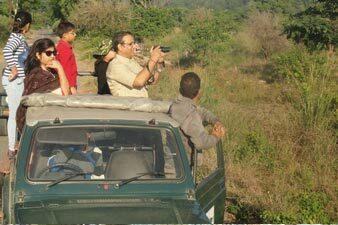 Drop at Ramnagar, tour End with sweet memories of Jim Corbett National park. In the morning, after breakfast get ready to check out from your hotel and return back to your destination with beautiful memories. Room on double /triple sharing basis. 3 breakfast 3 lunch and 3 dinner. Recreational activities in resort premises. Bonfire with lite music (only winters). Jeep safari on extra cost Rs. 3800 (Dhikala/Bijrani/ Jhirna/Sitabani/Dhela, Durgadevi). Expert guide during the safari. Adventure activities in Kosiriver(river crossing, bridge falling & rappelling).